Allan Anderson is Professor of Global Pentecostal Studies and Director of the Graduate Institute for Theology and Religion at the University of Birmingham. - Publisher This book analyses the context, history, theology and praxis of the first Pentecostal missions in the first two decades of the twentieth century. 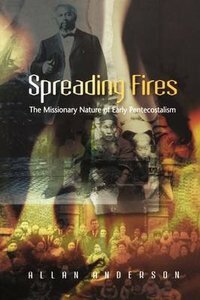 Based largely on primary sources, it explores the social and historical context in which Pentecostalism arose, the revival, holiness and healing movements associated with it in the late nineteenth century, and the influence of colonialism on Pentecostal missions. It traces the stories of Pentecostal missionaries and 'native workers' in Africa, China, India and other parts of Asia, Latin America and the Caribbean. The first part of the book is historical, while the second part is analytical, missiological and theological. It looks at the doctrine and experience of the Spirit so central to Pentecostal mission, the emphasis on evangelism, healing and premillennialism, the translation and contextualization of the Christian message by Pentecostal missionaries, and issues of religion, race, gender and culture. It concludes with an analysis of the missionary nature of Pentecostalism and the contemporary implications of this for the wider church. This book analyses the context, history, theology and praxis of the first Pentecostal missions in the first two decades of the twentieth century. Based largely on primary sources, it explores the social and historical context in which Pentecostalism arose, the revival, holiness and healing movements associated with it in the late nineteenth century, and the influence of colonialism on Pentecostal missions. It traces the stories of Pentecostal missionaries and 'native workers' in Africa, China, India and other parts of Asia, Latin America and the Caribbean. The first part of the book is historical, while the second part is analytical, missiological and theological. It looks at the doctrine and experience of the Spirit so central to Pentecostal mission, the emphasis on evangelism, healing and premillennialism, the translation and contextualization of the Christian message by Pentecostal missionaries, and issues of religion, race, gender and culture. It concludes with an analysis of the missionary nature of Pentecostalism and the contemporary implications of this for the wider church. Allan Anderson is Reader in Pentecostal Studies at the University of Birmingham. He is the author of five books, including Moya: The Holy Spirit in an African Context (1991), Zion and Pentecost (2000) and African Reformation (2001), and has edited two collections including Pentecostals after a Century (1999) and Asian and Pentecostal (2003).